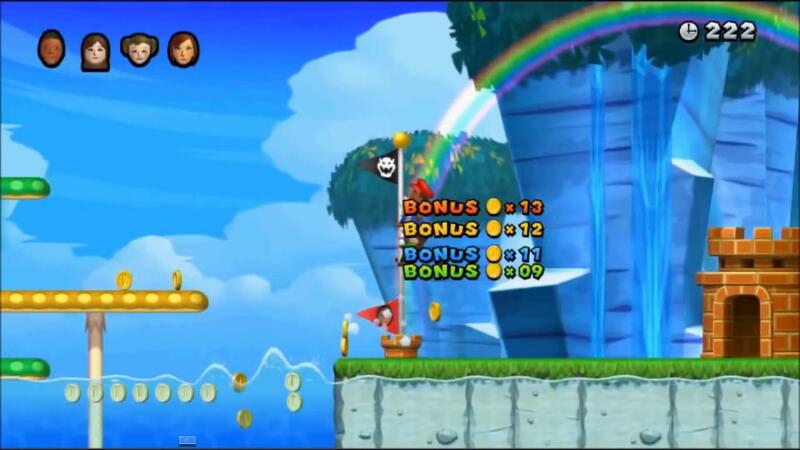 The New Super Mario Bros Series first originated when New Super Mario Bros was released for the Nintendo DS in 2006, old school Raggle Fraggle readers will recognise that I mentioned this game in my top 5 Mario games of all time back in 2012. 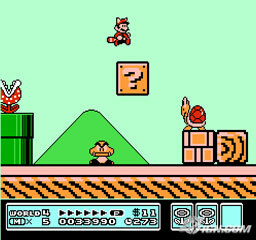 I love the original New Super Mario Bros it felt just like Super Mario Bros 3 but with a more modern twist, it had newly improved graphics, more power ups and most importantly a save feature. The Original New Super Mario Bros game was fantastic and I still love playing through it today, but I was never able to get into the other games of the series because they felt boring to me and I haven’t looked forward to the series for a good couple of years. Ever since I got a Wii U I kept getting recommended that I pick up the latest New Super Mario Bros game, obviously I argued that I wouldn’t buy the game but I just kept getting told to play it and it wasn’t until I saw Jirard the Completionist Review the game telling me that its actually good that I gave in and got myself a copy. 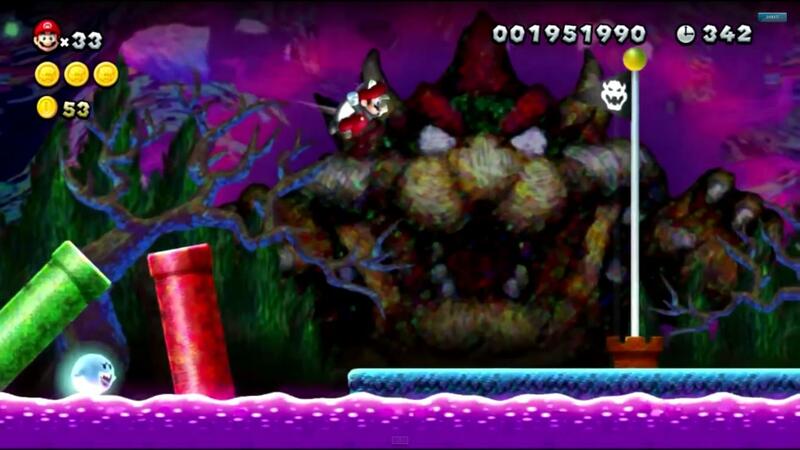 The first thing that really stood out to me was the plot, yes it was still the usual Super Mario Bros formula where Mario needs to rescue Princess Peach from the claws of Bowser, but this time there is a slight twist because instead of kidnapping the Princess, Bowser has taken her hostage within her own castle and at the same time he manages to toss both Mario, Luigi and two Toads to the other side of the Mushroom Kingdom, what makes the plot different this time around is that now our heroes need to adventure back towards Princess Peaches castle instead of the usual formula of them heading towards Bowser’s castle, apart from that the plot is still very standard but this does not bother me because I never expected anything more in a New Super Mario Bros game. Just like the other games in the series this particular title is also a side scrolling platform adventure, in the single player story mode you take control of everyone’s favourite Italian plumber Super Mario on his quest to save the Princess from the infamous Bowser and in the traditional Super Mario style you will be dealing with common enemies such as Goombas, Koopa Troopa’s, Para Troopa’s and Cheep Cheep’s, but don’t be put off by the lack of new enemies to fight because the game really shines when it comes to Power-up’s sure you got the usual Fire Flowers, Power Stars and Mushrooms including some Power-ups introduced through the New Super Mario Bros series such as the Ice Flower and the Mini Mushroom but this time around we are also given a new type of power up the acorn, acorns turn Mario into an adorable flying squirrel allowing him to glide freely across levels with ease. 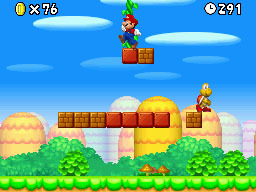 Mario’s lovable side kick Yoshi returns to help him on his quest, Mario can ride Yoshi which allows him to gain more air as well as being able to take an extra hit, Yoshi can also eat apples that he finds on bushes and after eating enough of these apples the player will be presented with either a power up or an extra life. 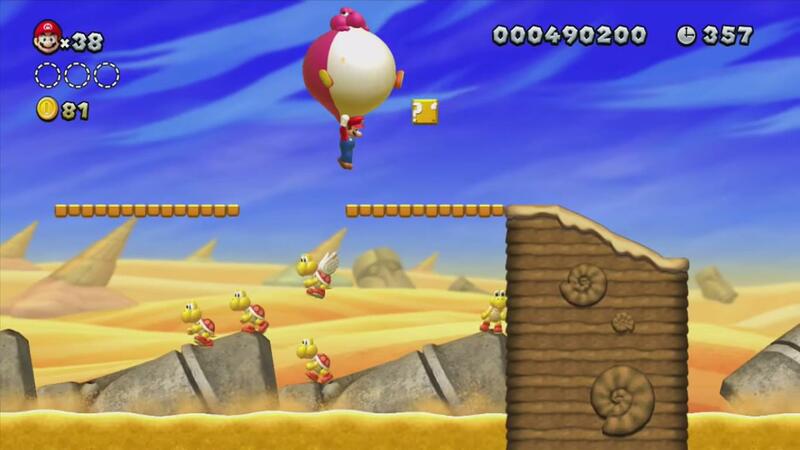 Its not just ordinary Yoshi that’s helping Mario on his adventure this time around because you can also get help from Baby Yoshi’s, the Baby Yoshi’s are these adorable little chubby Yoshi’s which come in three different colours Red, Blue and Yellow, each of these Baby Yoshi’s have a different ability which they can use to help Mario get through different situations. 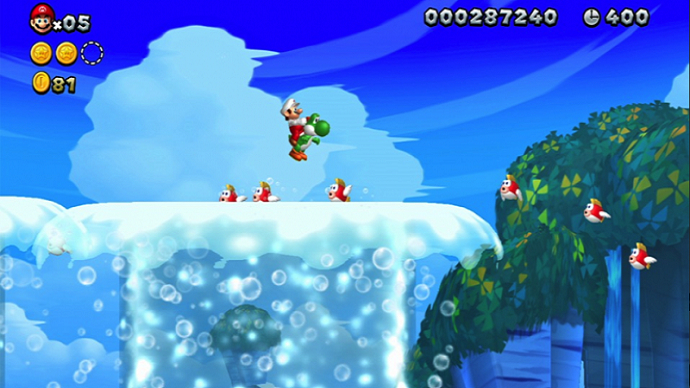 The Red Baby Yoshi can inflate into a giant balloon lifting Mario up into the sky allowing him to float over difficult platforms and too avoid some of the more dangerous enemies in the game. 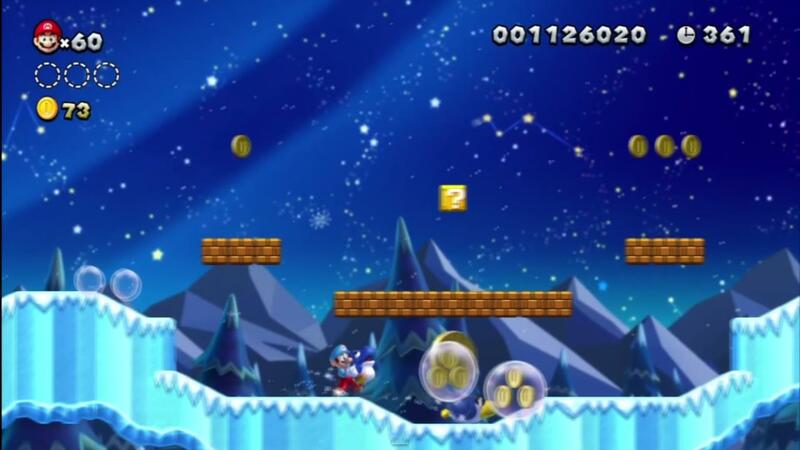 The Blue Baby Yoshi has the ability to shoot bubbles out of his mouth trapping enemies into bubbles and successfully turning them into coins. 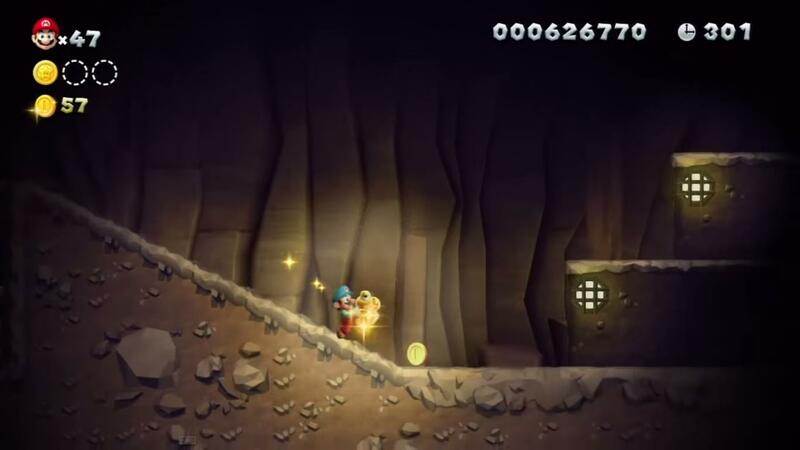 Finally the Yellow Baby Yoshi can be used to light up dark caverns as well as temporarily stunning enemies. I really enjoy the introduction of the Baby Yoshi’s as they add more flavour to the game and are genuinely very useful, the best part is that they sing while you are carrying them and trust me its very adorable. This is the first entry of the series that is on a system that uses a HDMI output so it is expected that the game will look fantastic in HD and for the most part it looks really good the graphics are very colourful and genuinely nice to look at, the textures are smooth and the game in general is very nicely presented, the visuals look good but with this being a launch title they should look amazing because this game is supposed to be showing off the capabilities of the Wii U and having visuals which literally just look like the graphics from New Super Mario Bros Wii but with more polish is not going to make the game a system seller. 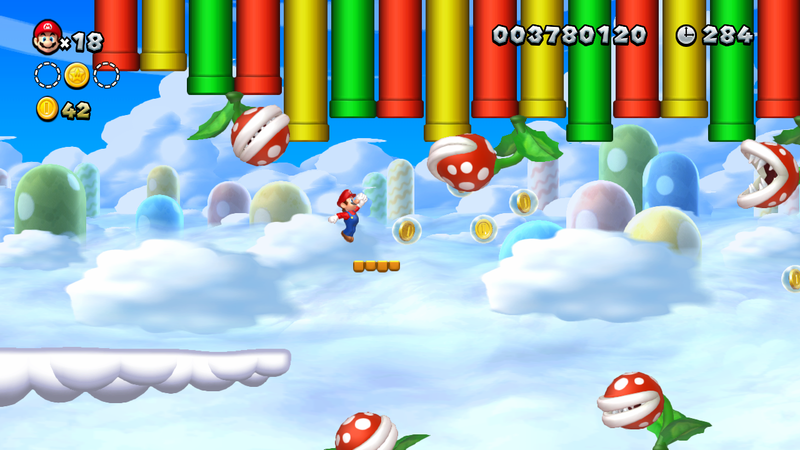 All of the music in the game is super fun to listen too, it’s essentially the same music from the old games with a more modern twist as its more engaging and upbeat, this kind of music is perfect for this type of game because due to this being a standard Super Mario plat-former using standard Mario music is fine and honestly I am a happy with Nintendo keeping the epic orchestrated Mario music in their larger and more serious games such as Super Mario Galaxy. 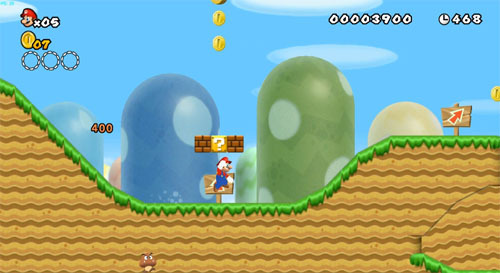 There are 8 worlds in the game and each world has a various amount of levels for you to complete, the worlds them selves are nothing new just the basic over world map for a 2D Mario plat-former you’ve got the grass area, the desert area, the water area, the ice area and so on, this does not bother me in the slightest because the levels themselves are really fun to play and honestly I had blast running through all of them, however one world really stood out to me and that is the Jungle Area the levels here are really fun but the back grounds are really awesome and very well detailed, about half way through this world you get to a haunted section of the Jungle and the stages have painted backgrounds which genuinely look really beautiful and this really helps show how creative Nintendo can be. 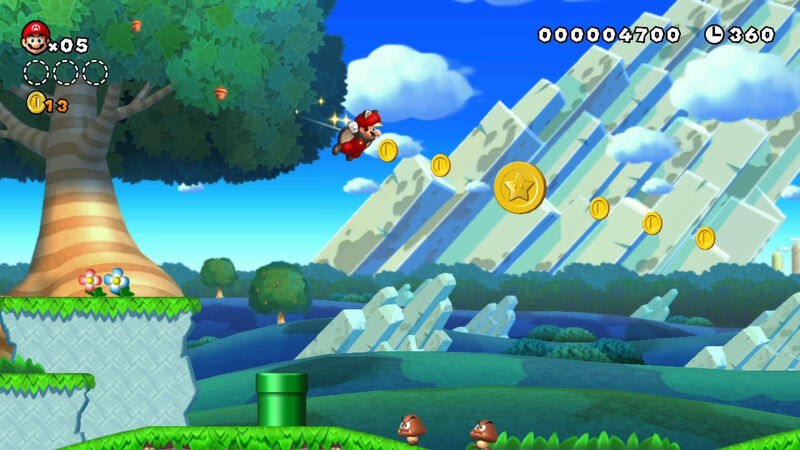 I was pleasantly surprised with how difficult the game was because in my opinion we haven’t had a very challenging Super Mario game since Mario 64 and I honestly thought that we would never get a very difficult Mario game again, but that’s all changed now that I played New Super Mario Bros U because this game is really tough, I believe this due to the game having genuinely difficult game play but also due to the fact that the player has limited chances to save their progress, this is because just like in the older games the only way to save your progress is too beat a mini boss tower and if you game over before you do this then its back to the beginning of the world. I am very happy that this game was hard and it felt almost as challenging as the Mario games from back in the day, personally for me it genuinely made the game very nostalgic to play through, the controls are perfect I had no trouble playing this game with the Wii U game pad as it was very comfortable to use and I found the controls to be very responsive to my actions which is great because that means that even though the game is very difficult the controls are not too blame for me losing lives meaning that my only cause of death was own mistakes. 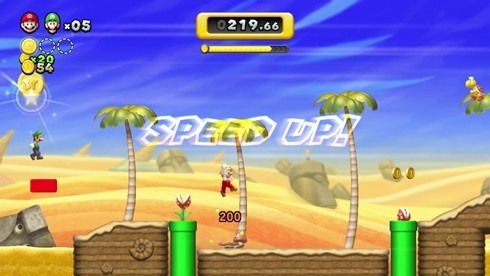 If you do find the game tough then do not worry as Nintendo has added a small mini challenge to the game, a new character has been introduced called Nabbit the Bandit Rabbit, Nabbit has stolen a new type of power up called the Super Acorn from Toad and its your job to run through previously beaten stages as fast as you too catch Nabbit, doing this will reward you with the Super Acorn which allows you to fly as much as you want during one stage but after you have used it you are left with the abilities given to you from the normal Acorn power-up, this new item is very similar to the Super Leaf from Super Mario Bros 3. 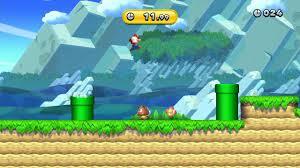 As well as Nabbit you can also find the usual Toad Houses which can be used to help you gain more power up’s and lives. 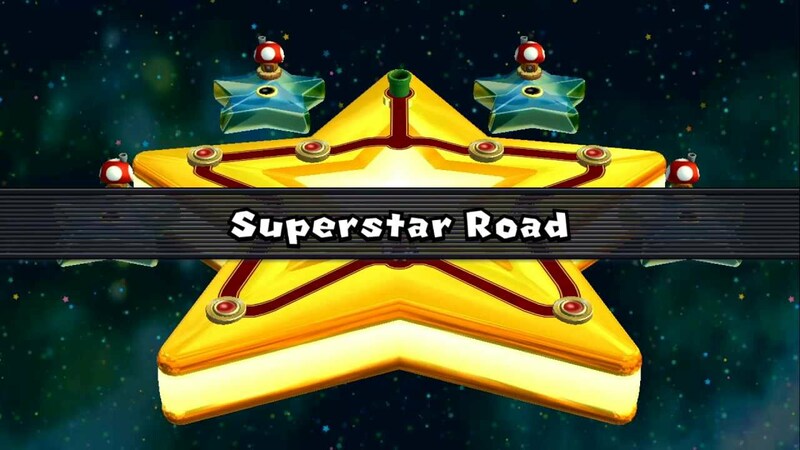 In every stage there are three star coins for you find and collect, if you mange to collect all of the star coins in the game you will get access to Superstar Road which is essentially a bunch of new very challenging levels for you too complete, in order for you to collect all of the Star Coins you will also need to find secret exits in some of the levels of the game, finding these exits will present you with a new path and a new level on the world map. 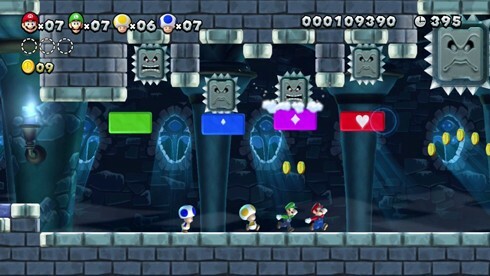 Multi-player is loads of fun in New Super Mario Bros U, it is essentially the same as the single player mode but you can have up to five players, four of the players will use Wii remotes to control Mario, Luigi and the two Toads while the fifth player will use the game pad to create platforms for the other players and they can also help defeat enemies by tapping them. From the Main Menu you have various options for extra modes in the game these modes are called Challenges, Boost Rush and Coin Battle. 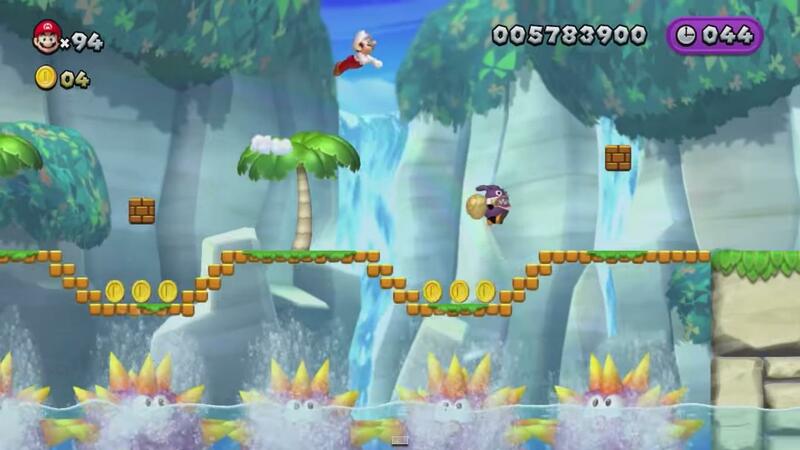 Challenges- Just what it sounds like you have a bunch of different challenges you can play and unlock, some of these challenges include racing against the clock in time trials, jumping on enemies to gain lives, finishing stages with a certain amount of coins, avoiding fireballs for a set amount time and some challenges require you to create platforms on the game pad while controlling your character with the Wii remote or the Wii U Pro Controller. Boost Rush Mode- This mode gives you various packs to choose from and each pack contains a certain amount of levels from the game, these stages are now different because they have now been turned into scrolling stages and your tasked with getting through the levels quickly so that you don’t get crushed by the other side of the screen that is coming towards you, as you progress further in each level the faster the screen scrolls making this mode very challenging but also very fun. Coin Battle- This mode is super fun you and your friends must run through multiple courses and the idea is you want to collect as many coins as you can in the level, you can attack your friends to make them lose coins which you can then try to collect and the overall winner is whoever reaches the flagpole with the most coins in their pocket as you can tell this mode can get a little crazy. 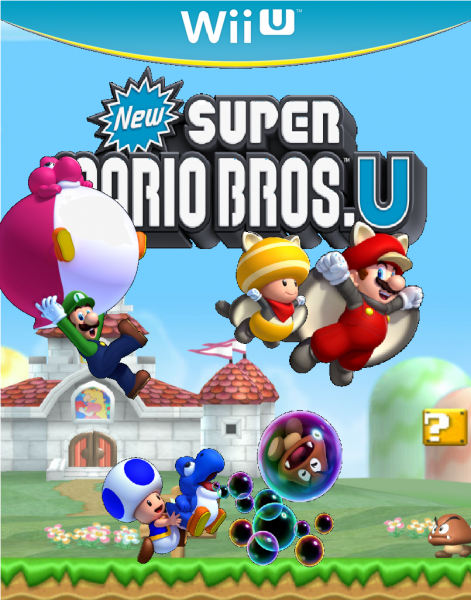 I was very sceptical of whether this game was as good as everyone made it out to be, sure I had few personal complaints about the game but it was still loads of fun to play and it brought a lot of new things to the table such as the Baby Yoshi’s and the challenge modes, New Super Mario Bros U is loads of fun to play and even though it is very challenging this game is a great time for the whole family, but I wouldn’t go out of your way to buy a Wii U just to play this particular title. This is a fantastic , in depth review of this game. With havin so much content and articles do you ever run into any issues of plagorism or copyright infringement? My site has a lot of completely unique content I’ve either created myself or outsourced but it looks like a lot of it is popping it up all over the web without my authorization. Do you know any techniques to help prevent content from being stolen? I’d definitely appreciate it. Amazing! Its in fact awesome article, I have got much clear idea concerning from this paragraph.